I received an impromptu invitation Saturday afternoon. It was from my neighbor, who was taking some friends to a wonderful slice of the swamp. Shangri La Gardens in Orange, Texas is the legacy of the Stark family. Lutcher Stark took the land his father owned and added to it. Then he sculpted and tweaked it until it became the marvel it is today. Being the closest thing to Blackwater Hattie my neighbor knows, I get to go on these outings as a guide. A five-year-old girl was with us. A well-behaved child, she was curious about all she saw. She learned to look past the surface of the water to see spotted needle nosed gar swimming with black bass and perch as we entered this wondrous realm. A trek down the path to the edge of the bayou had us in the children’s section of the exhibit where hands on is not only allowed, it is encouraged. Stones, bones, skins and shells she got to handle. She grew more interested as we went along, darting up to see the lizards I spotted, and watching turtles and minnows swim in the shallows. All the while, in the background, songbirds sang and the calls of the Great White Egrets and cormorants rang out from the rookery. Muscadine grapes hung green in the canopy while the last of the blackberries offered a sweet taste of early summer while we walked to the flower gardens. 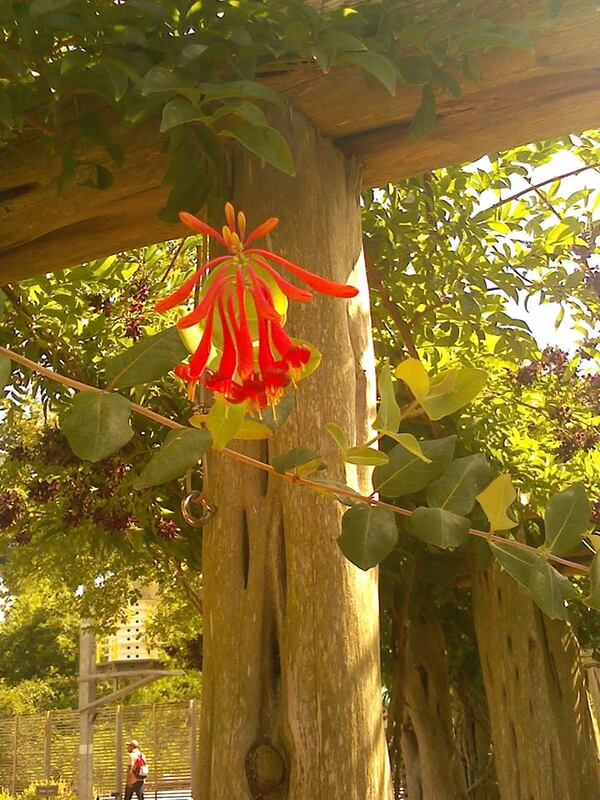 I found a favorite of mine from childhood, red honeysuckle, growing on trellises. 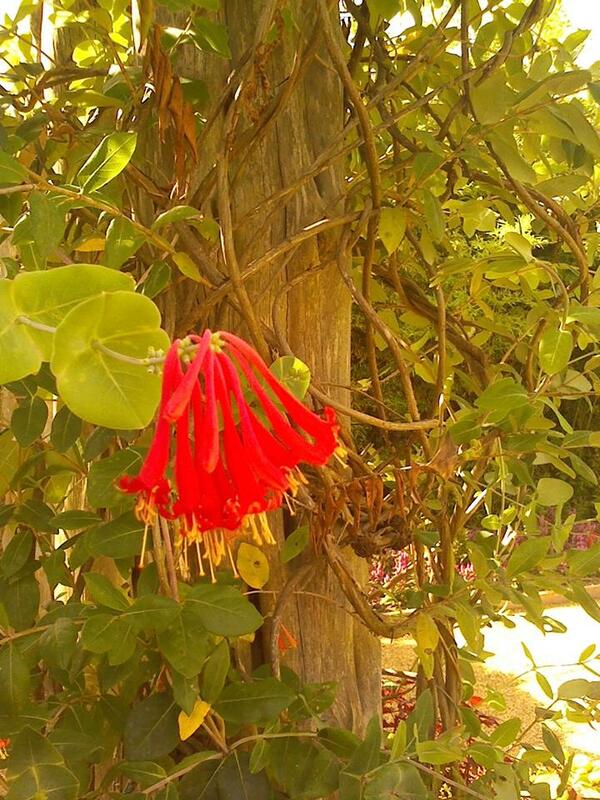 For a moment, in my mind, I was back in my mother’s garden where her prized red honeysuckle grew. As a child, I plucked those lovely trumpets and sucked the nectar like a bee. Bees. There is an apiary where the covering of a hive can be opened to view the bees through glass as they build comb and fill it with honey. So cleverly devised, it protects bees and people from each other. We all had to stop and watch the busy pollinators at work before going deeper into the garden. Flowers everywhere splash bright colors along the trails among the huge oaks and cypress. At one trail’s end is a small lawn on the edge of the lake that serves as the rookery for the egrets and cormorants. As we watched, a Great White Egret swooped in for a landing on a cypress. Two young egrets squawked and begged until their mother fed them as my new little friend looked on in wonder. The trip would have gone on, but we were told that the garden was closing in a few minutes. As we wandered toward the gate, I spied something lovely and potentially delicious blooming in the bright sunlit shallows. I asked my friend if she knew what marshmallows were. She assured me she did. 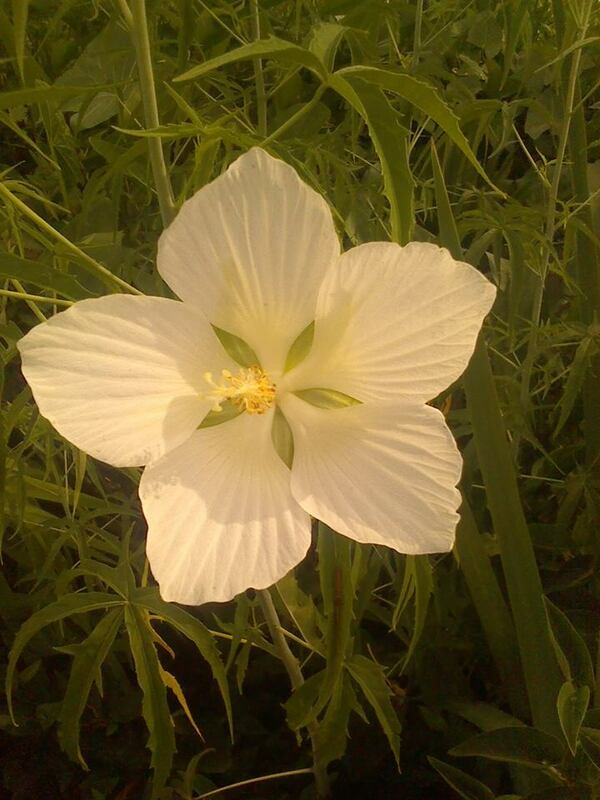 Then I showed her the big white flower of the Marsh Mallow and told her how the candy was originally made from the plant and that was how it got its name. The adults were as interested as the child. With that, our visit was over and we made our way out the gate. I hope to go back again and again to the wonderland in the swamp. Thanks. I was able to clean it up because you let me know it was a mess. Swamp people know what blackwater is. When the rivers and bayous pass through heavily forested areas, the water turns dark because it has steeped all the leaves like tea. There was a song about a swamp witch named Blackwater Hattie. The town people wanted to get rid of her until a sickness fell on them and Hattie made the cure, left it in town with a note to never look for her again.